Good things come in 3’s…not 1, not 2, but THREE chocolate cakes. I wanted to do a post about chocolate cake. But then I had a think and decided I could do better than that. What, you may ask, could possibly be better than a chocolate cake? Three chocolate cakes! I present to you the Chocolate Almond Flourless Cake, the Chocolate Raspberry Buttercream cake and last but not least, Nigella Lawson’s Sour Cream Chocolate Cake. Steady on, because I love chocolate. 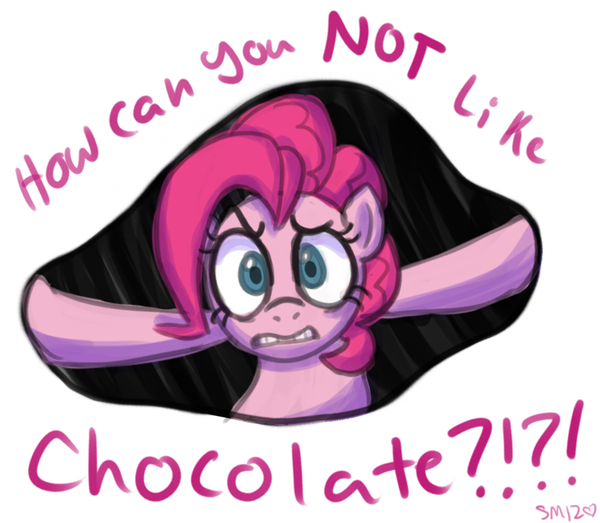 However, chocolate cake…I just don’t really get it. It’s like chocolate in a poorer format. Mix it with all that flour and butter and I think it loses its sparkle somewhat. Now obviously many chocolate lovers out there would call this slightly blasphemous. So I’m working on my love of chocolate cake. A hard task I know, but someone has to do it. My work began with the discovery of a Flourless Chocolate Cake, which is cake 1 of 3 today. It uses ground almonds instead of flour and is therefore gluten-free – find a coeliac, and make their day with this cake. 1) Firstly, preheat the oven to 170C/Gas 3/fan oven 150C. Grease a 23cm/9in springform cake tin and line the base with greaseproof paper or baking parchment. Dust the sides with a little flour. 2) Melt chocolate and butter into a heatproof bowl set over a pan of gently simmering water. Heat until melted, then remove the bowl from the pan and stir until smooth. Now leave to cool while you get on whisking the egg whites. 3) Separate eggs. Yolks can be mixed in with ground almonds, while the whites need to be whisked with the sugar until soft peaks form (soft peaks are when the whipped whites are just beginning to become stiff, but will still melt back into shape when moved). 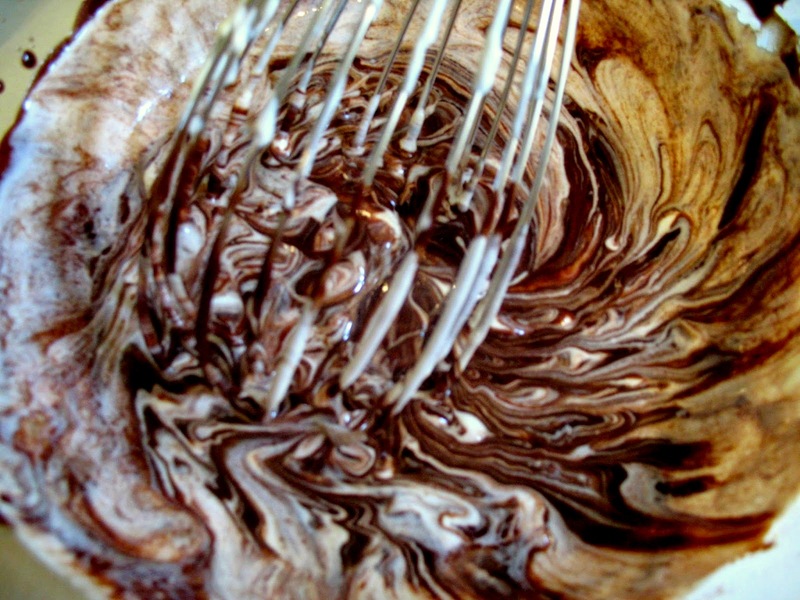 4) Now you want to slowly fold the whisked egg whites into the chocolate, almond and yolk mixture. This is a very important step in order to achieve a light airy cake – don’t just mix the two up, gently add in blobs of the whisked egg whites and fold into the chocolate mix until combined. 5) Pop the mixture into the prepared tin and bake for 30-35 minutes until well risen and just firm to the touch. Cool in the tin, and don’t get disheartened if it cracks or shrinks. It’s perfectly normal and will still taste fantastic. This cake goes down really well as although it’s very rich the ground almonds add a real lightness to it. You can leave it plain or, like I did slice it in half and ice it. 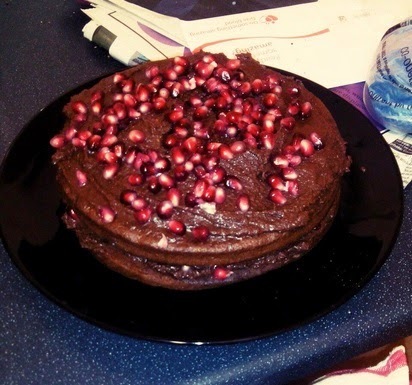 A simple ganache of melted chocolate and double cream (equal measures of both) is fantastic, and with a sprinkle of pomegranate seeds it’s almost like one of your five a day. Now time for the Chocolate cake with Raspberry Icing. Made with real raspberries, it’s a perfect chocolate/berry combo. The chocolate cake recipe comes from the ever-fabulous Mary Berry. It’s essentially just a chocolate victoria sponge mix and is a great base for a variety of icing and topping options. 1) Heat your oven to 180°C/gas mark 4. Use 2 victoria sponge sandwich cases for this – grease and line bottoms. You then want to measure the cocoa into a bowl, add the boiling water and mix until you form a rich, chocolatey paste. 2) Add the remaining ingredients and mix until well combined – use a whisk and some elbow grease, or use a hand mixer or food processor – far easier. Now to just divide the cake mixture between the prepared tins and bake in the pre-heated oven for about twenty-five to thirty minutes until well risen and shrinking away from the sides of the tin. 3) For your icing, whip out my favorite…good old frozen berries! You can use fresh, but frozen works just as well. Defrost slightly in the microwave, then blend up. 4) Once blended, it’s a little bit annoying but we’ve got to get rid of those pesky pips. So push blended berries through a sieve into a bowl and you should be left with some delicious fresh raspberry puree in the bowl. Now you want to blend this with your butter and cream cheese, along with the sieved icing sugar. This results in a gorgeous pink, thick icing. 5) Ice the top of one cake, then place the other on top and repeat. Decorate with a few extra berries, and your raspberry chocolate cake is done! By this point, you might start thinking I’m not as reluctant to bake/eat chocolate cake as I initially set out to be. And with the discovery of this third and final cake, I feel sure my feelings towards chocolate cake have changed dramatically for the good. It’s moist, rich, and really everything you’d want a chocolate cake to be. This is a Nigella Lawson recipe taken from her book How to be a Domestic Goddess. Make this cake and you will have more than earned your domestic goddess stripes. 1) Quite a lot of ingredients! But it’s actually a complete doddle to make. All you have to do is mix the flour, baking powder, bicarbonate of soda, cocoa, butter, eggs, vanilla and sour cream in a food processor or electric mixer and mix until you’ve achieved what looks (and tastes like…mmm) like a good, chocolately cake batter. Divide cake mix between the two tins and bake for about 25-30 minutes. When cake is done it will start to shrink away from the edges of the tins. 2) While that’s baking make the icing. Melt the butter and chocolate in the microwave or over a gentle heat on the stove, combine fully and leave to cool a little. Now stir in the sour cream and vanilla. This is when it all starts to look fantastic. 3) Add in your golden syrup, and sift in the icing sugar and whisk together. My icing was a little runny for my liking, so I popped it into the freezer for 10 minutes which worked well. As for icing the cake, you’ll want to leave it to cool down beforehand, but pretty much…just slap it on! In an attractive manner, of course. I found some sugar flowers in my cupboard and decorated it with those – perhaps you could use sprinkles too? Or go very retro and dig out those silver icing balls from your birthday parties as a kid. Three chocolate cakes down, and I’ve not only found a love for chocolate cake but also a whole variety of chocolate cakes for different occasions. 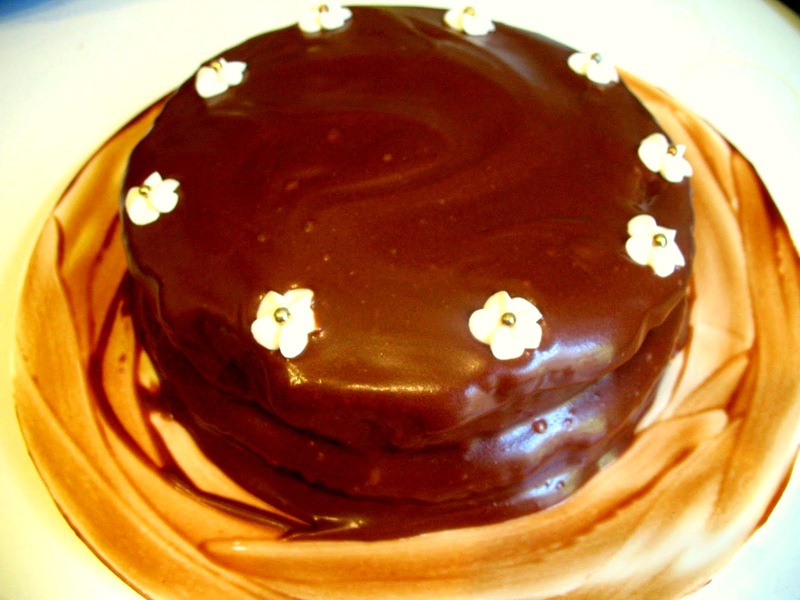 Bake your flourless chocolate cake for something a bit posh, as its dense chocolate flavor is ever so sophisticated. 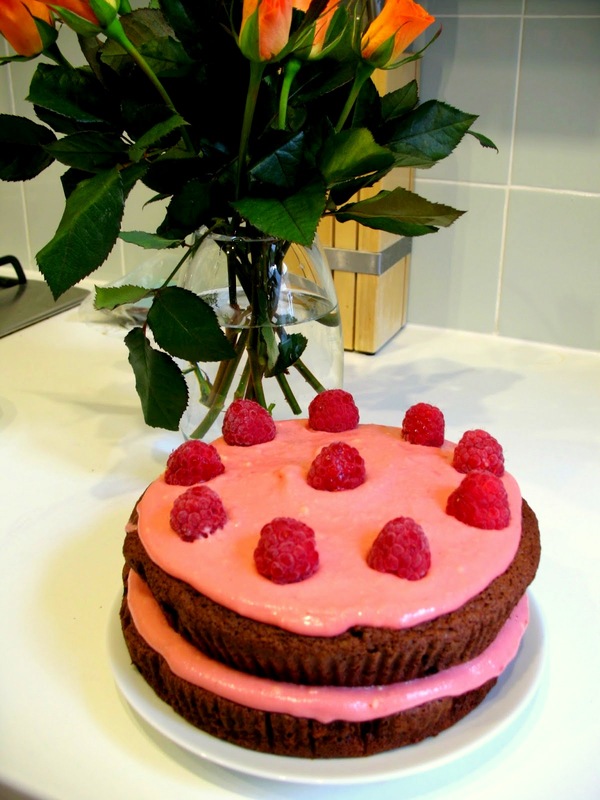 The raspberry chocolate sponge is visually stunning and makes a great cake to bring to any party. And make the sour cream cake for when you seek nothing but pure, smooth, chocolatey goodness. Whatever your chocolate craving is, one of this three is sure to soothe it!